You may now…kiss the slot machine. Sound kind of strange? Hey, when you're dealing with The Three Stooges, anything goes. That's especially true in The Three Stooges: Brideless Groom where Shemp is all set to get married. He's got his tux. He's got the chapel. He's got the cake. He's even got the ring. The only thing missing is a bride. Still sound kind of strange? Again, we're talking about The Three Stooges. 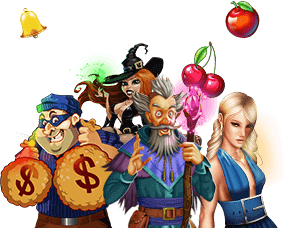 And in this 33-payline slots game based on the classic TV episode, a zany adventure is an understatement. You may not end up finding Shemp's bride, but you'll feel like you're on a permanent honeymoon with so many ways to win. This 5-reel slots game includes a top award of 29,997x your bet per line, a re-spin feature game, a Stooge Picks game, and a random Lucky Stooge free spin round. So try it now and get ready to fall in love. Got cold feet? Relax. Playing The Three Stooges: Brideless Groom is easy. Start by making your bet and lines selections. In this 33-payline game, you can play 1 payline, all 33 paylines, or anywhere in between. You can also bet between $0.01 and $5 per line. Your final bet per spin is your bet per line multiplied by the number of lines. If you like what you see, click Spin and watch The Stooges go crazy on the reels. You'll get paid out if you land on the matching symbols. If you want to play faster, up the Nyuk-Nyuk-Nyuk factor by turning AutoPlay on. It'll use your last bet and line amounts to spin, pay you out, and spin again! It can be tempting to play all 33 lines and bet the max, but not ever spin is a winner, despite the fact that you could win 33 free spins randomly or enter a free-spins round. For that reason, we recommend only betting 2% of your bankroll per spin. If you've got $100, bet no more than $2 per spin. We recommend playing all 33 lines to maximize your win potential, so play with the bet amount instead. Betting $0.05 per line would only cost you $1.65 per spin. Remember, as your bankroll grows, you can afford to up the ante. The Three Stooges Re-Spins: Cover off one reel with Stooge symbols and earn one free spin. Cover off two reels and earn three re-spins. Cover off two reels after covering off one reel and earn another three re-spins! Stooge picks: Cover reels 2, 3, and 4 with Stooge symbols and you'll play this bonus round where you'll get to keep uncovering prizes like wilds, prize multipliers, and more. It all ends when you hit two broken hearts. Lucky Stooge Spins: The Three Stooges are full of surprises. So don't be too shocked if you win up to 33 free spins. It could happen, randomly, at the end of a game.